I love frozen yogurt (froyo), so when an opportunity to buy froyo presents itself, I buy. We were in Megamall two weeks ago, and I spotted this very inviting frozen yogurt place while waiting for my husband who went to National Book Store. So we (me, my son and his yaya) went inside to order. I tried one of their signature creations called the CaliforniaBerry Special. It has mangoes, kiwi fruits and strawberries. I chose blueberry yogurt, instead of their original yogurt, as base, and I paid Php130.00 for a medium cup. I also ordered a smaller cup for my son, original yogurt with M&M toppings, but he wanted what I ordered for myself, so we ended up sharing my cup of CaliforniaBerry Special. His yaya ate his order instead. My son and I both loved it! He liked the blueberry yogurt, and I liked the combination of blueberry yogurt and fruits. 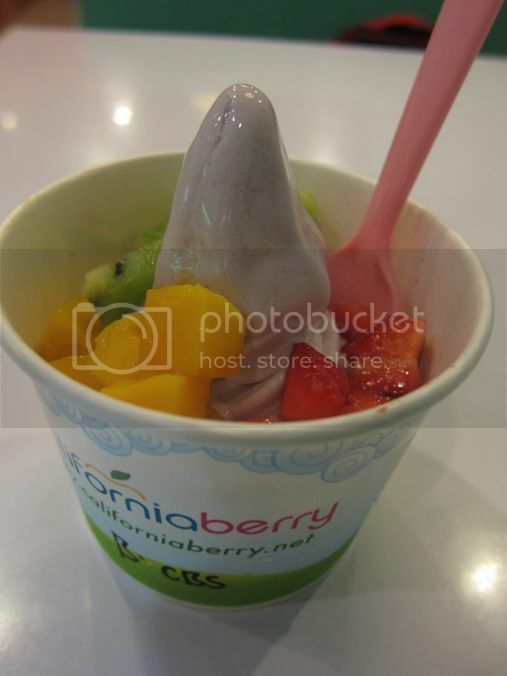 California Berry is 100% nonfat frozen yogurt. This entry was posted in Frozen Yogurt. Bookmark the permalink.